The summer travel season just kicked off, and Delta SkyMiles Award redemptions are already up by 13.8 percent compared to a year ago. The airline expects more than 3 million Award bookings for the summer travel months between June and August. 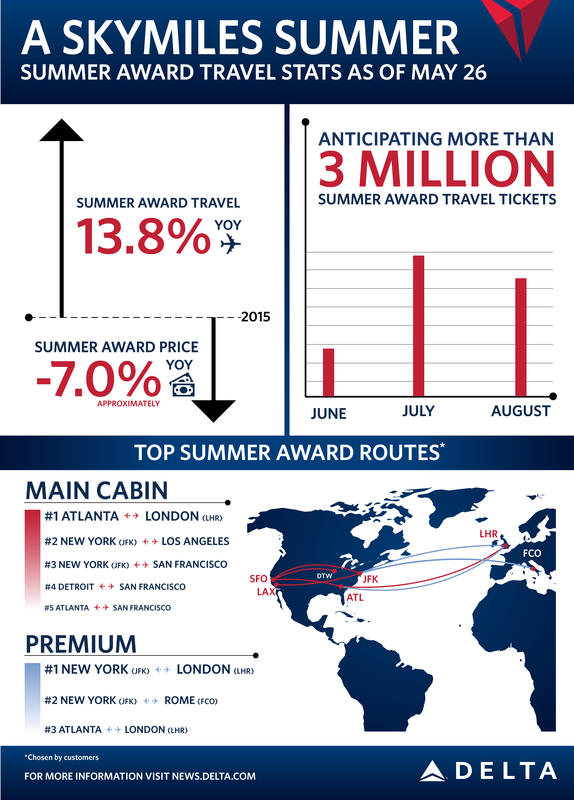 SkyMiles members fly on more Award tickets during summer than any other time of the year, with July on track to be a record-setting month. While summer Award bookings are up, the average mileage redemption amount during the same period is down approximately 7 percent – meaning customers are using less miles to travel. Delta continues to offer lower-mileage Award Travel and has already promoted seven Award sales in 2016. For more information on the Delta SkyMiles program, visit this page.